Doctor Yum Project Board Member, Heidi, shared a favorite holiday recipe that she found on Peas and Crayons. It is a perfect side dish, starring a versatile winter squash. Preheat oven to 400 degrees. Drizzle a baking sheet with a bit of olive oil. Add cubed squash to the baking sheet and drizzle with more olive oil. Sprinkle with salt, pepper, and garlic powder. Stir around to make sure the all the cubes get oil & seasonings, then spread the cubes out in an even layer on the sheet. Roast for 25 minutes on the center rack in the oven. At the 25 minutes mark, pull out the tray and add the fresh cranberries. Return to the oven for an additional 10-15 minutes or until the cranberries have started to soften and burst a bit. 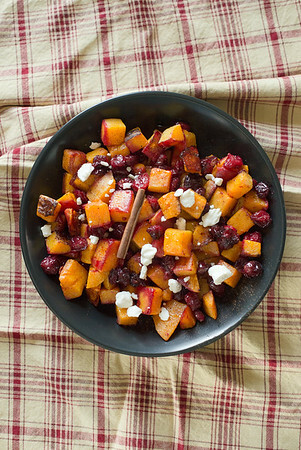 Remove from the oven and add a sprinkle of cinnamon along with the feta and honey. Fresh chopped parsley makes a colorful optional garnish.